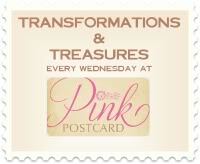 First I want to thank Denise at the Pink Postcard for featuring my trash to treasure caned chair make-over on her Transformations and Treasures No.16 Thank you so much! This is a table that we found at our neighborhood garage sale for $3.00! It was a little rough, very wobbly, but cute with LOTS of potential. Mr. T was kind enough to take the whole thing apart so we could glue it all back together and make it nice and sturdy. I took advantage of this and painted it BEFORE he put it back together. Much easier! I decided to go gray with this one! I painted the entire piece in a gray miss mix from Lowes. The edges of the table were painted white (hard to see in photo). Then I added some distressing! I decided to make this a "French" themed table. I took advantage of the cute shield design and the sides of the table and added a french graphic. I believe I found these at the Graphic Fairy, but I can't be for sure since I have had these saved to my computer for quite some time. None-the-less Karen has some GREAT graphics. Check her out! I used the old fashioned method of transfer paper, a design and a pencil. I removed the paper and transfer paper to reveal the traced design. Once I had transferred my design, I then hand painted it in with a charcoal gray (black and white acrylic mixed together) and highlighted in white. From there I lightly sanded over the design to give it a more worn feel. Then I sealed the whole thing in Minwax Clear and antiqued it with Minwax Special Dark. What a great make over!!! Great work! Love that you added details on the sides as well. You did an incredible job with this transformation! You have a new follower, and kindred spirit. Come by for a visit when you get a chance. love this - fabulous transformation! Your table is so cute! I love the graphics. Thanks for sharing the how to. I am going to try this. What a great job you did on this table. I love anything with French writing and vintage labels. Thank you for this great tutorial. I want to try this, however I do see that you did a great job with the leaves. I am NOT an artist and might have problems with highlights and low lights. This will certainly be on my list of great tutorials! !